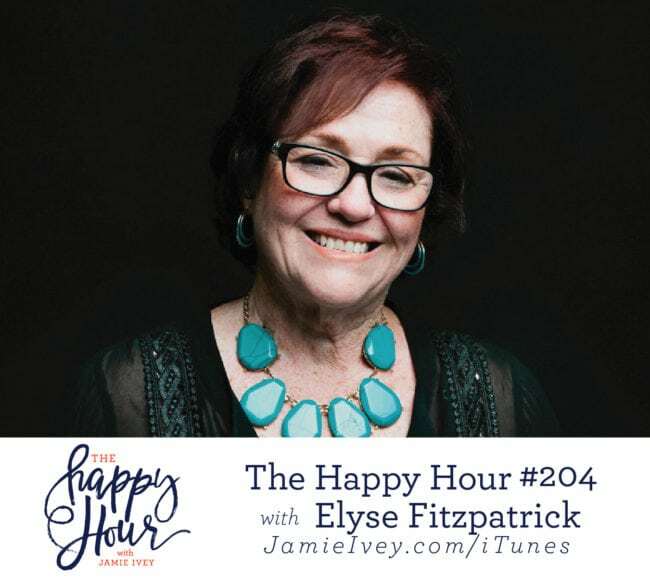 My guest for The Happy Hour # 204 is Elyse Fitzpatrick. Elyse is an author of nearly 2 dozen books on the gospel and Christian living, renowned speaker, and hosts a podcast with her family. Elyse is passionate about delivering the gospel to women and helping women see Jesus’ love everywhere in the Bible. Elyse is mom to 3 marrieds, and mimi to 6 grands, and she and her husband Phil reside in Southern California. Elyse and I start off the show talking about her motivation to write her most recent book: Finding the Love of Jesus from Genesis to Revelation. Elyse describes how she wants women to see how every part of the Bible is pointing to Jesus and His love for us. Elyse gives us several great examples of how we can see God interacting with women right from the beginning in redemptive ways – you guys, there were definitely parts of our conversation where I just had to take a moment because of the awesomeness and love God shows us through His word! In the second part of the show Elyse and I talk about how women may have felt dismissed or that theology was just “for the guys”. Elyse explains how Jesus not only tells us the Word is absolutely for all of us – women and men-, but she also points out specific ways Jesus calls us to know and love the Scripture as He did. We also talk about seeing women leaders rise up in the church and that no matter if you’re in a full-time vocational ministry or not, that we can know and love the Scripture – and as we do, we will understand more and more of Jesus’ love for us!